Bill Rushmer included Manor Fisheries in his "The Best of the Best" report covering the South East and mentions why: We have stayed twice in the lovely on-site accommodation at this exceptionally well-kept fishery. Cutting back many overhanging island branches. On the 18th January transferring a further 11 x double figure Carp to 20lbs and weighing a total of 162lbs from Lake 2 (Carp/Catfish); resulting in Lake 1 (Carp) now containing approximately 150+ doubles. During a sunny 13th March, Hadlow College including 7 senior students and 2 staff performed lake-wide netting – see below. Seven smaller Carp were safely relocated to Lake 3 (Mixed) and four rogue Catfish plus small silvers and Perch were safely relocated to Lake 2 (Carp/Catfish). Having worked through many maintenance tasks this winter, a holiday break to experience sunshine was a welcome break for Rhonda and I. 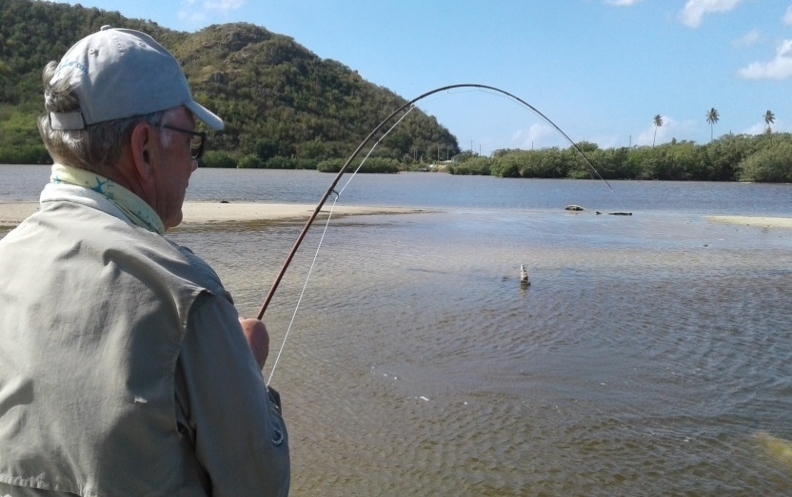 In addition the possibly some salt water fly fishing was tantalising and an opportunity not to miss. If salt water fly fishing is your thing (give it a go you have not tried it) and you enjoy sunshine (around 80°F to 85°F) plus wildlife, I can highly recommend contacting Nick Williams to guide you to various fishing locations and put onto Tarpon, Snook, Permit or Bonefish together with superb fly casting instruction. In addition Nick hosts on shore and off shore bait, lure and trolling sessions. Although a complete duffer at casting a fly, my luck eventually improved with “two firsts” on a fly as can be seen below. 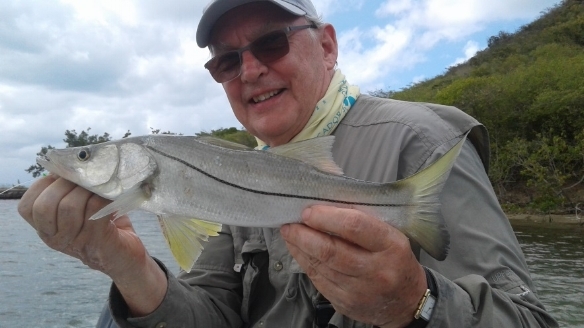 The Snook was caught from a backwater edged by mangroves and the Tarpon (20lbs) was caught from a lagoon that is located only 70 yards from the sea. The variety of bird life is very rich. Nick and his wife Karoll, contactable on www.reefviewapartments.com also provide great self-catering accommodation. With a cold northerly wind on a sunny day, the first day of our season was memorable as the Leader Board already contains some good results. It was good to see our regulars again plus several new faces. Congratulations to first time visitors Bradley Foelp and Chris Pearson, who achieved PB’s on our opening day and now both head our 2017 Leader Board. The first 7 days of the season produced an excellent 7 x 30lbs+ Cats, 5 x 20lbs+ Carp and a 6lbs+ Tench. Visiting for the first time on the 25 March, Bradley Foelp landed 4 x Carp including Mirrors weighing 17lbs and 14lbs plus Commons of 18lbs 2ozs and 20lbs 1oz (PB). Visiting on the 26 March, Lee Bridges landed a 17lbs Common and a 15lbs 2ozs Mirror while colleague Terry Bowdry landed Commons weighing 17lbs, 15lbs 2ozs and 15lbs. Regular Reg Miller returned on the 27th March and had a great day landing 9 x Carp including 3 x 18lbs, 2 x 17lbs, 15lbs 8ozs, 14lbs 12lbs and 9lbs 8ozs. When visiting on the 28th March, Ian Barrett landed an 11lbs 8ozs Mirror and a 22lbs 8ozs Common to top the 2017 Leader Board while colleague John Anderson landed Commons weighing 18lbs and 10lbs 8ozs. Tom Usher also visited on the 28th March and using boilie baits landed a 10lbs Common while colleague Peter landed three Mirrors weighing 12lbs 10ozs, 12lbs and 10lbs. Phil Russell visited on the 29th March and was successful in landing Commons weighing 13lbs and 12lbs plus a 15lbs Mirror while Will Timson landed 9 x Carp weighing from 13lbs to 19lbs. Ryan Kuyper visited on the 29th March and had a 10lbs Common while colleague Kyle Smith landed a 14lbs Common and a 10lbs Mirror. Rob Adams and colleague visited on the 30th March and landed 3 x Carp estimated at 20lbs to 25lbs each (did not have scales available). Arriving on the 30th March for a 24 hour session, Terry Tysoe landed 5 x Carp (4 x Commons plus a Mirror) ranging from 14lbs to 17lbs. Keith Heard landed a 35lbs 8ozs PB Cat when visiting on the 31st March. Using halibut pellet and squid boilie baits, Jonathan Black was soon into an early Cat weighing 22lbs 10ozs on the 25 March. Visiting for the first time on the 25 March, Chris Pearson landed his first ever Cat which weighing a creditable 37lbs 8ozs (PB) from Lake 2 (Carp/Catfish). During his visit on the 31st March Richard Edmonds landed a 17lbs Common from Lake 1 (Carp). Regular Kevin Oxley arrived on the 25 March and the following day soon landed his first Cat for the season which weighed 32lbs. During his great early season 120 hour session Kevin landed additional Cats weighing 36lbs 4ozs, 34lbs 12ozs, 32lbs, 30lbs 10ozs and 25lbs 6ozs. Regulars Ian Davies and Nick Burden visited on the 27th Match and using halibut pellet Ian landed a Cat weighing 33lbs 14ozs while Nick used chorizo bait to catch a 28lbs Moggie. Jason Tuckey began his 24 hour session on the 28th March and was successful in landing Cats weighing 28lbs 8ozs and 15lbs. Wayne and Pauline Young targeted the Carp on the 30th March landing Commons weighing 15lbs and 12lbs. While visiting during a short break, Phil Platt caught a good Tench on the 27th March weighing 6lbs 4ozs to head the Tench 2017 Leader Board. His catch included a further 11 x Tench, an 8lbs Common and 7 x Roach to 2lbs. On the 29th Phil landed a further 7 x Tench between 2lbs and 4lbs plus a 6lbs Mirror and a 5lbs 3ozs Common. Phil’s last session on the 31st March ended with 14 x Tench and a 7lbs 8ozs Mirror. The 28th March saw the return of regular Fred Rosier who landed Commons weighing 6lbs 12ozs and 6lbs 3ozs plus Bream of 3lbs 3ozs and 2lbs 12ozs. Regular Bernard Day returned on the 29th March and landed Tench weighing 2lbs and 3lbs plus Commons of 6lbs 10ozs and 4lbs.